A Little Time and a Keyboard: Python Printable Games Review--Website Fun! Python Printable Games Review--Website Fun! I am always on the look out for adorable, printable games for my daughter to do. 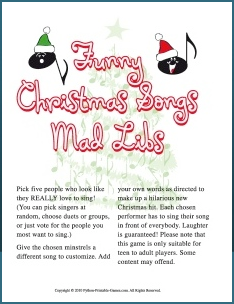 So, when the opportunity to review some festive Christmas printable games by Python Printable Games came up, I jumped at the chance. I had the pleasure of trying out some of Python's Christmas games. I was amazed by how innovative some of the games were. There are trivia games, mad libs, scavenger hunts, crosswords, and more. I particularly like the Cleanup Scavenger Hunt for Christmas Eve. Hopefully, it will inspire my daughter to cleanup with special care. Maybe I could use one of those every night! There are games for every age and even some games targeted directly at office parties. (One of the office games that struck me was a cute one for handling the office gift exchange. Good idea!) All of the games come with answers, which makes for ease during answer time. My daughter's eyes opened right up when I showed her some of the kids games--especially the trivia. She played the Truth-or-Turkey Game over the weekend with some friends and loved it. I can't wait to give her some more of the trivia games to do. It is great to have these on hand for spur of the moment fun. There also are a number of free printables on Python's website---always nice! (You know that I love freebies!) You can get the free printables here after signing up for Python's newsletter. The newsletters will also include coupons and giveaways. Python has a ton of games for all sorts of occasions, so check them out!